This book is on sale on Amazon for $0.99 (regularly $1.99) 9/19/2018 - 9/26/2018! Xanthe Schneider is a new mother, called back to the world of espionage at Bletchley Park. Her mission? To discover the whereabouts of the ‘Bismarck’ battleship on behalf of the British war effort, using a decoded signal from the Luftwaffe general in Athens. But like her previous missions, this is going to be no straightforward assignment. 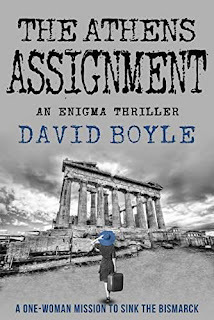 Can Xanthe live undetected under the noses of the Nazis occupying Athens? Can she call upon her special training with the Enigma code to save thousands of lives? And can she do all this and return safely to the side of her newborn baby, a place she desperately longs to return?..